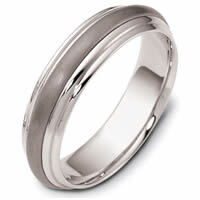 14 kt white gold and titanium, comfort fit, 7.0 mm wide wedding band. 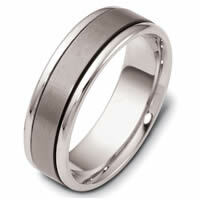 The titanium portion is satin matte finish and the white gold is polished. Different finishes may be selected or specified. 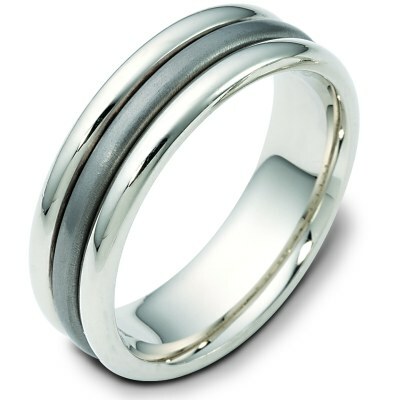 The rings we chose required customisation. The customisation was a wider band which meant the braid then looked much smaller in reality than the photos on the website. Overall we are pleased with the result but not entirely over the moon with the whole experience. The final result did not have a wider braid to ensure proportionality of appearance was maintained. Requests for confirmation of what the customisations were to ensure our order was accurately manufactured was met with a when complete we will confirm the customisations. If undertaken incorrectly it would have been too late to change. Possibly a more proactive order confirmation earlier in the process could be more useful. 7/10.